Yesterday I spent part of the day helping a young man build some get home bags for his family. Now get home bags are designed for one purpose, to help you home during an emergency. The content of each bag depends on how far from home you travel. If you never travel more than a few miles from home and the area in which you live has a moderate climate and the walking is easy, your get home bag can be very small. If you travel a lot and it would take you several days to get home, your kit should be much larger. Any get home bag I build assumes that I will have to spend at least one night out and that the weather will be lousy. A get home bag should be a flexible thing, it should change with the weather and be easy to add too if you have to make a longer than normal trip. It should always start with the highest priority items. If you live in Alaska and it is winter, this would be clothes and shelter, in Arizona it may be water. The first is the pack; this greatly depends on your requirements. I have quite a variety of these, but for a small lightweight get home bag, like we were building almost any small backpack will work and not attract a lot of attention. Shelter and fire starting – This includes clothes and hiking boots, sleeping bags if needed. In the bag we made yesterday, we included ponchos, a good quality Mylar emergency bivy sack. We also included a 10 x 10 piece of black plastic and several large garbage bags. In case we have to use the above materials to make a shelter we added 50 ft of 550 cord, some 12 inch cable ties and 20 feet of duct tape rolled on to a pencil stub. For fire starting, we included a blast match, a magnesium block, storm matches and some cotton balls impregnated with vaseline. For the cotton balls and vaseline I like to store them in old 35 mm film cans. Water- we included a full nalgene water bottle, a life straw and some good quality water purification tablets. Where he lives there is quite a bit of surface water. Food- because this kit will stay in the car and the weather gets quite hot in the summer and occasionally freezes in the winter, we put in Mainstay Rations. These while not my favorite food will provide 1200 calories a day and last for 5 years in the trunk of your car, regardless of the weather. In addition, we threw in some energy bars. These are something that he will use and replace from time to time. First Aid kit- Again this depends on what you are likely to be facing. We put the following items in the kit we made. 1 Ace bandage 2 in, always good if you twist an ankle. A good quality knife again this depends on your needs, budget and tastes. This is just a basic get home bag designed for someone who normally just travels a few miles from home and at most would have to spend a night stuck out. This entry was posted in bugging out, Seventy-two hour kits, Transportation, vehicles and tagged get home bag. Bookmark the permalink. I suggest throwing in a tourniquet as well. Last resort item, but this is a last resort bag. They weigh next to nothing, but when you need one- almost nothing else will do. Just learn how to use it properly before you need it. I disagree. The IBD is an excellent pressure dressing, however it is not designed for use as a tourniquet, and I don’t recommend relying on it- especially when the bleed is femoral. You won’t be able to get a complete end to blood flow, and a poorly placed tourniquet is quite dangerous. 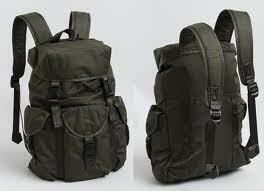 Get home, 72Hour and EDC bags should have every-day practical items so that you get maximum value from your preps. That medical kit could really do with some extra cheap & multi-use items; I would add a pair of EMT shears, water burn gel and a coagulant like Celox or Quickclot. As well as a fixed blade knife, a multi-tool is often more practical; the Leatherman Wave has the best scissors and plenty of other useful tools, or one of the Swiss Army cyber tools are excellent in an urban / office environment – mine gets a daily workout. I am right over paracord for a short-term pack; you can save space & weight by carrying kevlar spear-gun cord. It is less than half the weight & diameter while having 400 lb tensile strength. I always include a small tarp, so many uses, the grommet “holed” ones. distance from home. This saves constant adjustments..
Of course, you still have to compensate for change of seasons. I realized how load my whistle was when I tested it. I immediately put in a couple pairs of ear plugs that have a strap. You will want these if you blow that whistle, especially if in a confined space. A construction Crayon, dust masks and a hose bib key to get water from commercial buildings. All of my kits also include a military canteen and cup ( to boil water or cook with ) and I have also included a bag of white rice ($1)in a 1 liter pop bottle (free after I drink the pop) (will double later as additional water storage), lentil beans ($1), and a dozen bouillon cubes for flavor and water retention (sodium) ($1). As for the life straw I recently switched mine out for the sawyer mini ($20) which filters up to 100,000 gallons of water. I also have many other items but I travel pretty far from home most of the time….